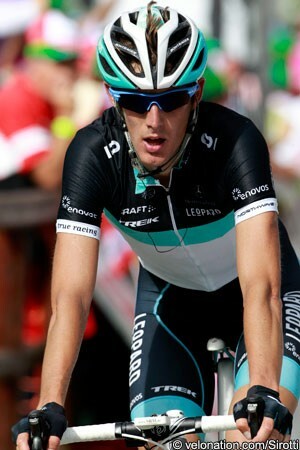 Andy Schleck (Leopard Trek) was an early casualty of the pace set by his own team on the climb to the finish at the top of Malbun, above Triesenberg, Liechtenstein, in the sixth stage of the Tour de Suisse yesterday. With the Tour de France a little over two weeks away, most of his rivals for the yellow jersey are showing much better form in this and other races. The 26-year-old Luxemburger finished second in last year’s tour, and may yet be awarded the victory if the Court for Arbitration in Sport (CAS) rules against Alberto Contador (Saxo Bank-SunGard) in August. He is not worried about his apparent lack of form so close to the race though, he claims. Schleck eventually finished in 57th place on the stage, 14’15” behind stage winner Steven Kruijswijk (Rabobank); hardly Tour winning form, but no reason to panic, he says. Last year’s Tour de Suisse saw him finish 14th overall, just 1’57” behind elder brother Fränk; he currently sits in 28th place, 20’28” behind race leader Damiano Cunego (Lampre-ISD), with a tough mountain stage and a time trial to go before the end of the race. Up until the Tour de Suisse though, Schleck’s results have been comparable, if not a little better, than this time last year. In recent months he has finished 12th in the Vuelta al Pais Vasco, compared to 13th last year; eleventh in Amstel Gold, compared to 18th last year; third in Liège-Bastogne-Liège compared to fifth last year; and eighth in the Tour of California, compared with 24th last year. If he truly did sit up on the climb, and make very little effort to race up it, then there is no way of saying what his form is like currently. Schleck’s teammate Maxime Monfort, whose pace it had been that his team leader had been unable to match, is another who is refusing to panic about the Luxemburger’s current form. “I’m confident that Andy will be on top at the Tour,” he said to Sporza. “We’re not worried. He didn’t have a good day, but the Tour isn’t here yet. His condition now is similar to his condition of last year. While Schleck might well be retrospectively awarded the 2010 Tour de France, it looks as though he has a little work to do if he is to win the 2011 edition on the road.